The Negroni a la Ruta is a grappa-inspired, spirit-forward Negroni that beautifully showcases the Campari alongside a Candolini Ruta grappa and Montenegro Amaro. The Amarena is a sour negroni that combines a fruit-forward sour beer with Campari, a touch of Creme de Cassis, and rounded out with a Sloe Berry gin to showcase the assorted fruit flavors on the palate. 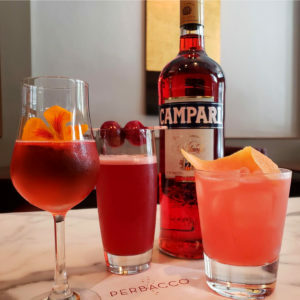 The Pompelmo #2 is a seasonally-inspired Negroni that incorporates the fresh grapefruit of the season, along with a local Trailmarker Rose from Mendocino and a Giffard Peche de Vigne, highlighting the fresh flavors and colors of the season surrounding the Campari.